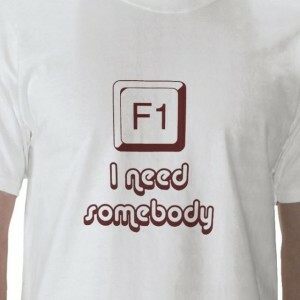 Geek t-shirts make the world go ’round. There’s nothing like the joy you feel when you find the exact right one for you. We’re here to help you make that choice. Most of these are unisex. Some aren’t. The ones that aren’t, we will let you know. And we’ll be a monster shoulder to cry on. Oh and these aren’t necessarily the best ones around ever, because there are literally thousands to choose from. So why not let us know some of your favourites in the comments? Go on. You know you want to. Do people dream of electric sheep t-shirts? Well, your dreams have come true. Geek titans ThinkGeek.com have this over in their store for between $18-20 depending on your size, that’s about €13-15. Everyone loves a good Snorg tee. Unfortunately you can’t get the correct spelling of armour on this shirt, but this will do because it’s geektastic. And not to go all ABBA on you but that’s the name of the game. There are bajillions (yes, that’s a number) of Pi jokes. This is one of them. And it’s very good. It comes from the good folks at Diesel Sweeties for between $17-18 which again is about €13-13.50. Just don’t try to take it into your maths exam. Rock crushes lizard. Scissors decapitate lizard. Lizard eats paper. Lizard poisons Spock. Paper disproves Spock. Spock vaporizes rock. Spock bends scissors. Simple. Find it on ThinkGeek.com. What do you get when you cross The Beatles with computer humour? 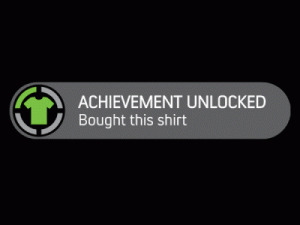 Well, this shirt, of course. 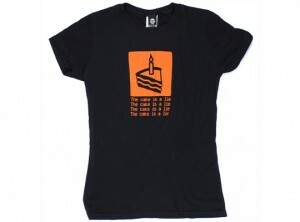 Find it over on Zazzle where the basic tee is only €16. There is a cheaper option for a value tee for €12.50 though. 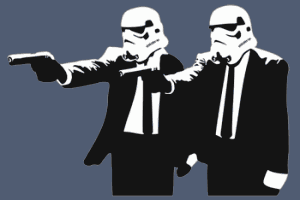 There’s something inherently funny about dressing Stormtroopers up. Give ’em Vincent Vega and Jules Winnfield’s garb and you’ve got this awesome geektastic movie cross-over t-shirt from Kapoww, motherfu*ker. In the event of a zombie apocalypse, please use this shirt from ThinkGeek.com as a reference guide. Use it well. It could save your life. Jurassic Park is a win. Any quote from Jurassic Park is a win. 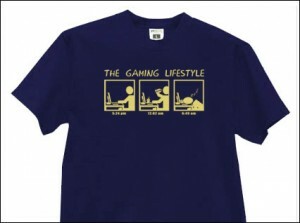 This one on this particular t-shirt is a win X1000. Well played, Snorg. Well played. 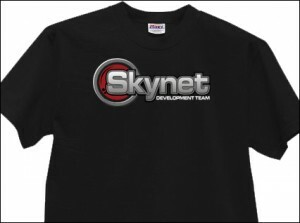 If you’ve been paying attention, you’ll know that Skynet was implemented on April 19, 2011 and began its attack against humanity on April 21. Sure, why don’t you join in the effort. I’m sure it pays well. Show your alliance with this tee from SPLITREASON. Fans of the triumph that was Joss Whedon’s Firefly unite in this TSHIRTBORDELLO shirt. For the Portal fans among us! One of the most iconic videogame quotes came from the scribbled madness on the walls of the Aperture Science Testing Facility. And now you can have it on a t-shirt courtesy of J!NX. You there! You try tell me you haven’t spent countless hours continuously pwning n00bs until you literally fall asleep on your keyboard/controller. You all know you have. Which is why this tee from SPLITREASON is particularly fitting. Get it? Fitting. Damn, I’m f*cking hilarious. 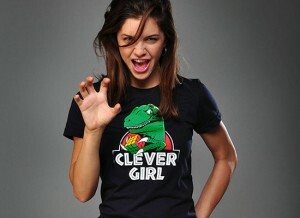 It’s a well-known fact that the closer a t-shirt gets to ThinkGeek.com, the closer it gets to being awesome. None is more representative of this fact than the 8-Bit Dynamice Life tee. They’re the his & hers robes for geeks. The life-force actually depletes on the t-shirts, only to be fully replenished when you get within hugging-distance of the other shirt wearer. Yes, it’s a little bit more pricey than your average tee. But this isn’t your average tee now, is it? 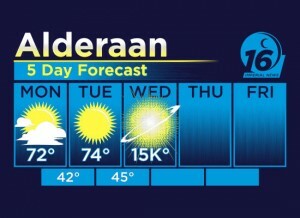 A little bit mean to the people of Alderaan, but mostly hilarious. This Snorg tee is a must-have. Achievement Unlocked: Bought this TSHIRTBORDELLO t-shirt. Directions for use. 1) Find this t-shirt on BustedTees. 2) Be awesome. 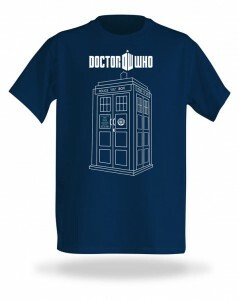 For fans of Doctor Who and Police phone boxes comes this tee, straight from the vaults at ThinkGeek. This shirt doubles as an actual TARDIS*. So impress your friends with your time-travel capabilities. It’s a winning party trick**. Another win for TSHIRTBORDELLO. See what happens when you mix Spock and Hip Hop? If a t-shirt is good enough for Dr Sheldon Cooper, hell it’s good enough for me. 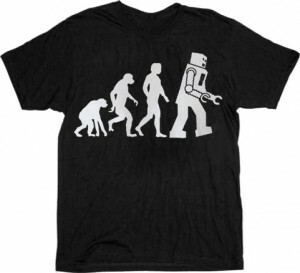 We all have to admit this is the eventual fate of humans, so let’s wear it proud. ROBOTS FTW! Coming up on Sick Sad World, buy this t-shirt from BustedTees. A force of nature in geekdom is Douglas Adams’s The Hitchhiker’s Guide to the Galaxy. If you’ve read it, you know that a Towel is one of the most useful and important items one can possess. So, for the next Towel Day (May 25, 2012), grab yourself this Douglas Adams inspired tee from ThinkGeek. This one is for the TTRPG fans. BustedTees are giving you the chance to own your very own 20-sided die on a t-shirt. What more could you ask for? 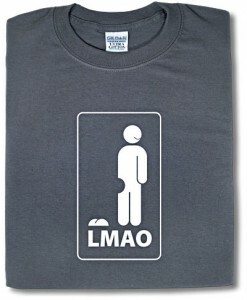 Internet acronyms on t-shirts always spell winning. Especially when coupled with a hilarious visual diagram. Thank you, ThinkGeek. Stop me if you’ve heard this one. Shakespeare walks into a bar, and the bartender says, ‘Oi, you can’t come in ‘ere! You’re bard!’ Yeah, best stick to this BustedTees shirt.